Cecil Bell was a city fellow from Staten Island and made his career painting everyday scenes of New York City’s streets, parks and harbors: its urchins, the well-to-do and weary washerwoman, dingy little stores and opera houses. But he and his wife spent thirty summers in a rustic cabin on a farm in Vermont. He painted farms and farmers, horse teams, landscapes, cattle auctions and barn cats. He kept this up for thirty years, and died in Rutland in 1970. 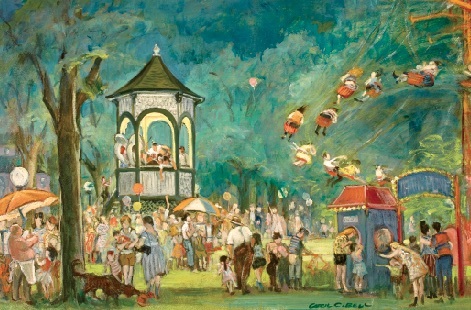 Mr. Bell was one of many artists who made their way to Vermont during that era. And it wasn’t just the views that drew them. Vermont’s pastoralism is a combination of the sublime and the earthy. There is something about life here that helps clear the mind of cobwebs and sharpens the senses. It’s good that those paintings are out there. They add to the record of an earlier time in our rural state, of the people, the work, the play, the buildings, and the landscapes. From these paintings we come to understand what things changed and what remained the same. They help spread the word about Vermont’s beauties across the nation. But every so often I find a painting that flew the coop and is now yearning to come back home. I rescue them when I can. If you know of a work of art with a Vermont connection, I would like to hear your story, just drop me a line or give ma call here at the store. Posted in Discover Vermont, Seasonal Activities.